Ideal low lint cloth for paint preparation tasks. TIDDOX makes a painter preparation wipe that you will make a permanent part of your inventory. The PAINTERS' MELTBLOWN POLYPROPYLENE WIPES are exactly what you need for your job sites. You know how infuriating it is to see paint footprints at the job site. No matter how much you school your painters, it seems like there is always an exception. A simple drip turns into a major mess when it’s tracked all across the floor. Then, you get a painters’ cloth and soak it in a solvent, only to have it come apart as you scrub the stains. With our MELTBLOWN POLYPROPYLENE WIPES, you can soak up spills and scrub surfaces with solvent without problems. These thick, low-lint towels are absorbent enough to hold on to solvents, chemicals, oils and and paints, yet easy to work with. Whether you use gel stains on the new stair risers or oil-based stain for the crown molding, these disposable painters’ cloths will be tough enough for the job without leaving behind lint or streaks. 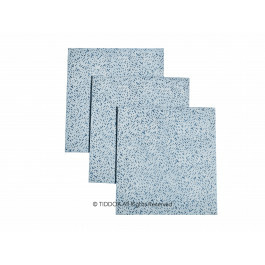 The light blue towel has sealed edges to reduce linting and each cloth is 35cm X 40cm in size, with 50 cloths per pack, 12 packs per carton - enough to spilt amongst each crew and paint site. Think of all of the chemicals you use inside and outside of the home, and all of the different viscosities of liquids and semi-liquids, and then remember that our meltblown wipes will absorb and hold all of these substances. Order a carton of our painters’ towels and experience a professional finish! Other related painters' cloths, wipes and rags include the LOW LINT INDUSTRO WIPES, the SOLVENT RESISTANT WIPES and the WHITE RHINO ROLLS.